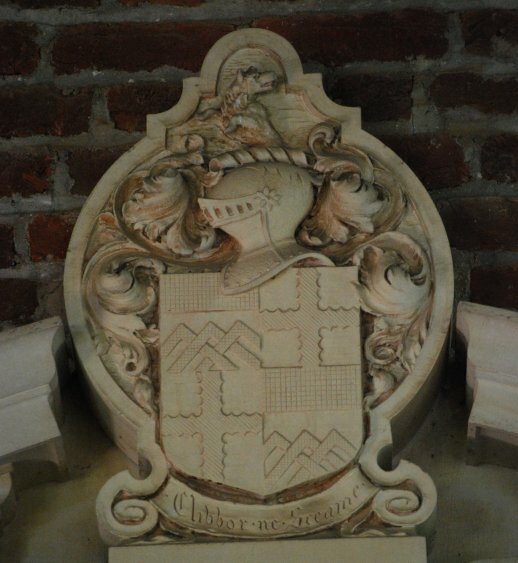 The first coat of arms that I am going to discuss displayed in the church at Jamestown tare those of William Claiborn. The arms are hatched: Quarterly, 1 and 4, Argent three chevronels braced and a chief sable; 2 and 3, Argent a cross engrailed vert. The crest is a bit harder to make out, but appears to be A demi-wolf erect reguardant.